Hello and welcome to my Kumho Crugen HT51 review. It’s not often that budget tire manufacturers unsettle the premium ones with their products. With tires, it’s almost always “you get what you pay”. Well, that is unless you buy the Kumho Crugen HT51. These tires are made for light-duty trucks, SUVs, crossovers, and vans. They are very popular with buyers due to the lower price than premium tires. The reason why they are so popular is that they are specifically designed with highway driving in mind. Highway driving in an SUV you say? Well, sure, people today love to buy SUVs and crossovers, but that doesn’t mean that they buy them for off-road driving. Instead, the opposite is the truth – they buy them for long-distance highway driving. They simply like the space they offer, and the image of driving an adventurous vehicle. The best highway tires for crossovers, SUVs, and Trucks should offer high levels of comfort, quiet ride, long tread life, the ability to perform well even when the vehicle is loaded, and of course all-season capability. The Kumho promises to tackle all of those things in their Crugen HT51 and I am going to find out if that’s the truth here. The Crugen HT51 is packed with high-tech features to the roof – Kumho really gave everything it had here. 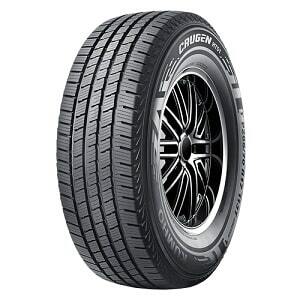 First of all, the Crugen HT51 is made out of all-season tread compound molded into an asymmetric shape with an optimized block layout for long-lasting performance and long tread life. Straight-line stability, something that is very important for a highway tire, is covered by the five-rib tread pattern with stiff center block, while the four wide, circumferential and zigzag grooves create a vortex effect for better water flow and less hydroplaning. Like almost every other tire in this class, the Kumho Crugen HT51 is equipped with 3D ZigZag sipes that provide the tire with biting edges for light snow. The most interesting thing about the Crugen HT51 is that it’s equipped with the 3PMSF symbol (Three-Peak Mountain Snowflake), which means that it is even rated for driving in heavy snow. This is a higher rating than the “M+S” which you can find on other all-season tires. Durability and tread life is covered with the strong internal structure with two ply-polyester and two wide steel belts on top of the casing reinforced by spirally-wrapped nylon cords. Other than durability, these features enhance highway stability, handling and ride quality. Well, at least that’s what Kumho says. If you’ve read this far, you’ll notice that Kumho gave their Crugen HT51 model very high praise, but I am not here to tell you just about what Kumho says. I am here to tell you if this tire is really as good as they say it is. This is a highway all-season tire, which means it should be very durable. And I am happy to confirm that – the Kumho Crugen HT51 will last you for a long time before you need to change. 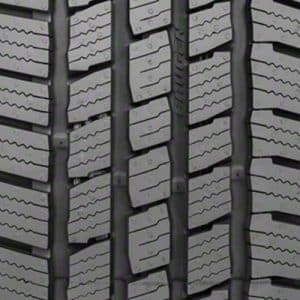 The deep tread will also stand against the test of time very well, or in other words, it will keep the wet and snow traction ability for longer. For a tire that’s used on heavier vehicles, and especially a budget one, I think that it’s a great showing from the Crugen in this area. This is not a high-performance tire, which means it will lack the precision and response in the corners. But when was the last time you were driving like a madman in the corners with your SUV? Never? I thought so. But I am sure that you drive your car mostly on the highway, and that’s where this tire shines. Straight-line stability is excellent and even sudden changes of direction on the highway will not unsettle the Crugen HT51. It’s probably not the best highway tire out there in this regard – that accolade will probably go to a premium one, but it’s very close and in my opinion sufficient for almost every SUV, pickup or crossover owner. While performance in the rain is not better than summer tires, it is still very good for most drivers. The Crugen HT51 has enough traction even in the most demanding conditions, like heavy rain, and it resists hydroplaning very well. It may not offer the best handling in those conditions, but on the highway, it is very stable and provides safe driving. If there is something crossover drivers want, that’s safety for their families, something the Kumho easily provides. One of the most interesting aspects of this tires for me is the 3PMSF symbol or the promised heavy snow capabilities. Well, this tire mostly delivers on that promise, but that doesn’t mean that you should drive it in the harshest winter weather. It’s adequate for snow driving, providing the driver with enough traction at lower speeds, but it is still far from a proper winter tire. If you want a tire that will have no problems whatsoever with the snow, winter tire is the only choice. Use the Kumho Crugen HT51 only when the snow surprises you. It is easy to see why owners love their Kumho Crugen HT51’s. They offer a very smooth ride, especially when paired with the soft suspension of SUVs and crossovers, and they are very quiet. As a matter of fact, this is one of the quietest tires out there – it is almost silent at lower speeds and droned by the wind on the highway. Excellent performance in this area for the Kumho, especially considering the much lower price than other premium manufacturers. I will cut the chase here – the Kumho Crugen HT51 is an excellent tire for everybody that wants quiet, comfortable, and durable tire, that’s also stable and safe on the highway. The lower price is another advantage of the Crugen HT51 over premium tires – in this case, there is almost no difference if you pay more. Excellent job from Kumho!